SAINT PETER, Minn. – The Gustavus women’s basketball team is set to take on St. Catherine at 1 p.m. Saturday at Gus Young Court. The Gusties enter the contest 12-10 overall and 9-6 in the MIAC, while the Wildcats are 10-12 overall and 7-8 in the league. 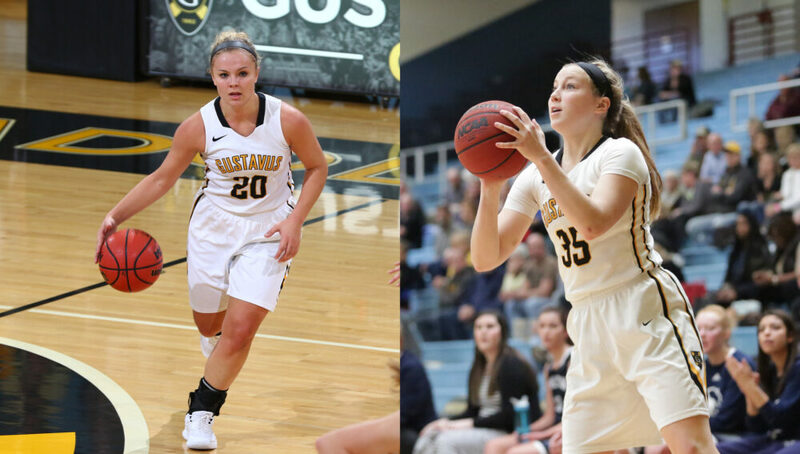 As is tradition at Gustavus, the final home game of the regular season is designated as Senior Day and a special tribute is made to the individuals who have dedicated themselves to Gustavus women’s basketball the past four years. This year, the Athletics Department, Head Coach Laurie Kelly, parents, and fans salute the two student-athletes who have represented the women’s basketball program with pride and class throughout their collegiate careers. Student-athletes honored today for their years of commitment include Justine Lee (Dawson, Minn.) and Kendall Thompson (Eden Prairie, Minn.). Gustavus is 5-2 in its last seven games, most recently losing to Augsburg 77-68 on Wednesday night at Gus Young Court. Through 22 games the Gusties average 67.2 points and allow 57.8 per game while shooting 40.7 percent from the field – all marks that rank fourth in the MIAC. An area of growth is rebounding as the Gusties average a league-worst 33.0 boards per game, but they distribute the ball well with 14.9 assists per game. The Black and Gold turns the ball over the least in the league with 14.8 per game. Kendall Thompson is a team leader with 14.3 points and 5.5 rebounds per game, along with 75 assists and 66 steals. Justine Lee averages 13.0 points and leads the squad with 24 three-pointers made. Paige Richert averages double figures as well with 10.1 points along with 5.7 rebounds. St. Kate’s is 3-1 in its last four games, most recently defeating Hamline 62-57 on Wednesday night in Saint Paul. The Wildcats average 62.1 points and allow 64.9 per game. They shoot 38.8 percent from the floor and haul in 37.2 rebounds per game. Danica Cambrice and Audra Clack are the one-two punch, averaging 16 and 15 points respectively. Cambrice shoots 45.8 percent from the field and Clark is the team’s best free throw shooter at 74.7 percent (71-95). Jackie Radford leads the team in the post with 6.9 rebounds per game.